The melody lifted and soared as if born of, and upon, the wind itself. Song formed from breath, shaped and made smooth and comely by the texture and soul of the cedar love-flute it flowed through. I’ve been enamored with the first-nations love-flute from the moment I first heard it. This particular day we sat in the midst of a strange community of hikers pausing briefly on their pilgrimage to Katahdin to celebrate and rest. To our left along the grassy bank was a young couple, he with long hair tied back, she with dreadlocks, in matching red raincoats. My eyes were drawn to them. Something about their gentleness with each other, their smiles, their quiet laughter stilled and quieted my soul. To my right, just below the embankment was an average 50-ish man in jeans, t-shirt and round glasses sitting in the lotus position, eyes closed, posture perfect. Directly ahead of me was another gray-haired, bespectacled 60-ish man sporting a ball-cap embroidered on the back with the name “Strider.” One of my favorite characters in all of literature. Was that his trail name? The place was Damascus, Va. The event was Trail Days 2011 and we were all, amid the distractions that are part and parcel of a street festival like this, basking in the music of Wind-talker, Randy Motz. For an hour or so, his flute-song created a small sacred space for us. Few words were spoken but it was clear, to me at least, that Wind-Talker and I had a mutual Friend…Maker, Graybeard likes to call him. Earlier, as Wind-talker was setting up his gear we shared a little conversation. To be fair, I did most of the talking. Randy and his wife Georgia (“Mom” as she’s known on the trail) had done a thru-hike several years prior and in the process of asking him about his hike, I found myself confessing my own desperate longing to do the same. Familiar phrases fell naturally from my lips as I described this haunting, “The woods have become my sanctuary, the AT my obsession.” He spoke little, nodded much and told me I might enjoy the book he and his wife had written: The Walk: Reflections on Life and Faith from the Appalachian Trail. Afterwards I took him up on his suggestion and he generously signed the copy I hold now in my hands. I spend most of my days in sweltering heat, covered in sawdust, surrounded by screaming woodworking equipment. Each morning before starting my day I show up a little early, find a spot to sit down behind the building and as John Muir puts it let “…nature’s peace… flow into [me] as sunshine flows into trees. The winds will blow their own freshness into [me], and the storms their energy, while cares will drop off like autumn leaves.” Occasionally I’ll read scripture or some other book. The Walk became that book for a while. I began The Walk with high expectations. I longed to hear echoed in these pages that same melody that had poured forth from Wind-talkers flute. That’s not what I heard…at least at first. What I was struck by was the Motz’s command of the written word. Their writing style clear and concise, their vocabulary expansive but unpretentious, there was no confusion as to what they were trying to say. They said it well. I wondered though, as I read, if I had made assumptions about Randy based on our short conversation, that were incorrect. You see, I’m in a different place than many people who might read this post. For the past several years I’ve been discovering what it means to abide, to sink deeper into my Abba’s Love for me, outside the walls of the institutional church. Because of my distance from the Institution, I’ve become hyper-sensitive to and agitated by what I perceive to be religion. That’s not necessarily a good thing. I often get it wrong. If I’m not mistaken, Randy and Georgia are, at present, part of an institutional community of believers. Having said that, they strike me as a couple able to walk in complete freedom untainted by their affiliation with the System. Love, hope, encouragement and freedom are found in the pages of The Walk. I found myself reading with a pen in one hand and my journal in the other, scribbling down the inspirational and thought-provoking quotes that headed each chapter and are peppered throughout. The Walk is liberally seasoned as well with native wisdom from the likes of Lakota/ Sioux Richard Twiss and other native sages. Scripture quotations are taken from Eugene Petersen’s The Message which lends to it’s conversational feel. These along with the excerpts from their AT journal serve to transport the reader, vicariously, right to the Trail with it’s sounds, smells, tastes, beauty and pain. Without doubt my two favorite chapters are 5 and 6. The title of chapter 5, “Praise and Worship” , has mental associations for me of instruments, sound systems and compulsory singing and hand-raising. There’s nothing of the sort here. Randy and Georgia manage to capture the beauty and wonder of encountering God in what many would think an unlikely place, the wilderness. They express with eloquence and emotion, the soul-gasp that seizes ones heart when you unwittingly stumble upon a thin-place in the midst of an old forest, or the undeniable sense of Presence when the rhododendron choked woods open to a breathtaking vista. There’s no religion here…only spontaneous gratitude…eucharisteo , no matter your spiritual leanings. Chapter 6 relates their journey into simplicity. Winnowing down your world to what you can carry on your back is wonderful practice for doing the same in your non-thru-hike life as well as your spiritual life. It’s an ongoing, never-ending process. Realizing how our possessions can possess us and taking steps to change that may be one of the most important things we can do to reduce the clutter, noise and distraction that impede our walk with God. Randy and Georgia not only give practical wisdom on how to take those first steps but are open and transparent with the naked truth of how they struggle with this themselves. Honestly, with chapter headings such as “Family and Community”, “Praise and Worship”, “Pride and Humility” and “Service” something in my anti-establishment gut churns and braces to be guilted with a reminder of duty and obligation and how I should just try harder. Probably just the last tendrils of religion still clinging to my soul. Or maybe these headings are sheep in wolves clothing. Familiar phrases that evoke old pharisaical emotions but hidden inside them is the life-giving message of grace, hope and love. Hope I didn’t just give away your secret, Wind-talker and Mom. Oops. Thank you for the wonderful review of our book and such kind words. It was a pleasure meeting you at Trail Days. Little did we both know how that brief encounter would affect both our lives. 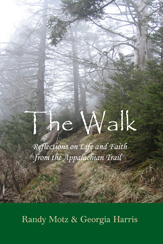 May you continue to find pearls of wisdom and moments of quiet reflection within the pages of “The Walk.” It has been a remarkable journey, hiking the trail and drawing from it the inescapable parallels between walking the trail and a walk of faith, and then putting it all on paper. We hope that we captured the essence of the spiritual wisdom that blossomed from our odessey. It is our prayer that others will seek out “The Walk” as a way to find the “white blazes” of their own spiritual journey.